In a few of our recent posts we have made reference to the fact that the rainy season is upon us. For eight to nine months each year here along the coast of Manabí Province we get almost no rain whatsoever. The trees native to this area (Ceibo, Algorobo, Acacia, and Palo Santo) are well suited to the yearly prolonged drought conditions and bounce right back into green life each January when the rains return. But, this year we have been noticing some other strange life emerging from the rain soaked ground. 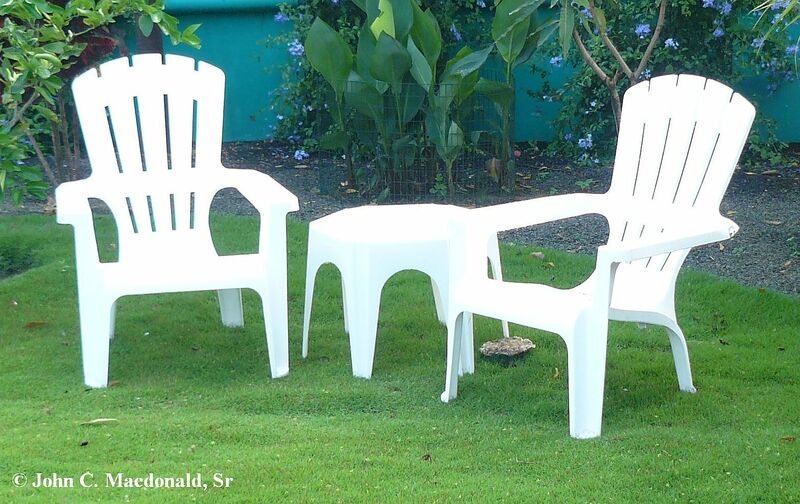 Look closely beneath the right chair and table above. What is that? 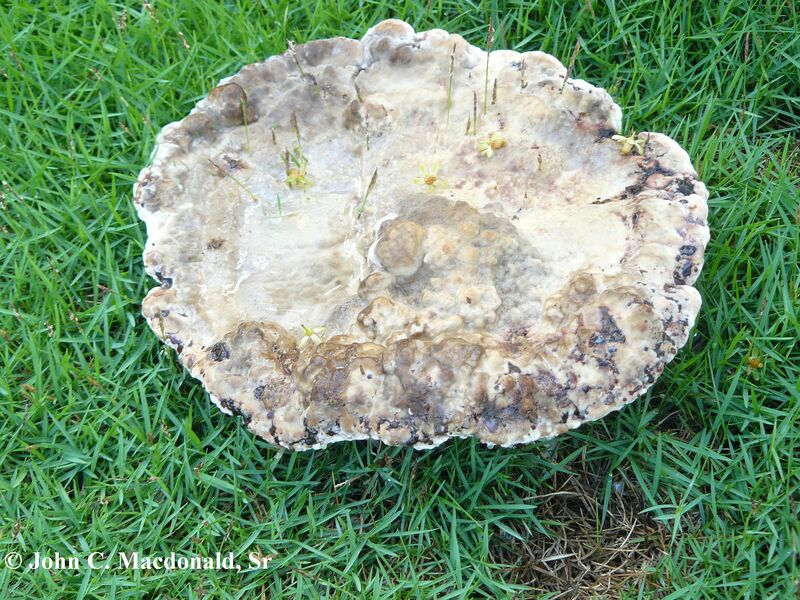 This round flat-topped mushroom measures about eight inches in diameter and sprouted up overnight right in the middle of the grass. 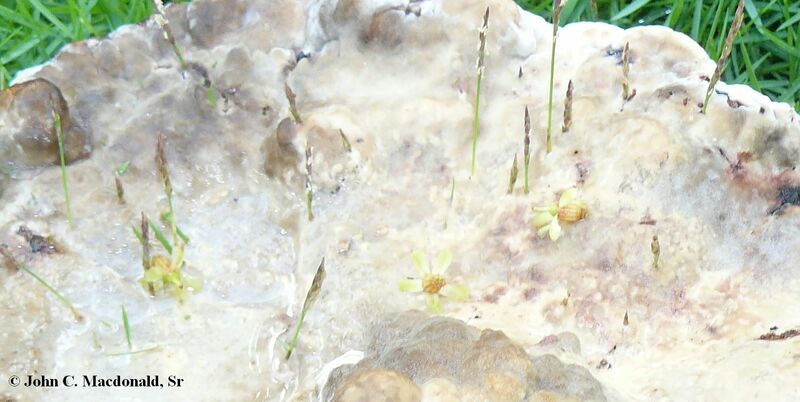 The grass, enjoying a growing spurt of its’ own, can be seen growing up through the mushroom in spots. The small blossoms are from a towering tall Teakwood tree that grows along the wall in that area. We also located two or three more of these big mushrooms in the yard. This next one was wedged along the concrete wall footer near our gate. And another was growing next to a post by our maracuyá vines. Although these are somewhat unusual looking mushrooms considering their size and “lava flow like” formations, at least we knew what they were. And, no kids, I did not try to eat them! But, what in the world are these? 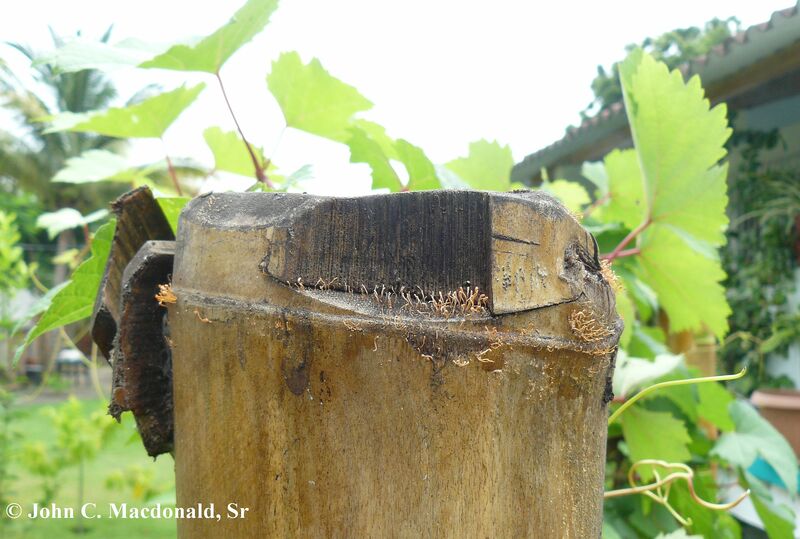 This is the top part of a bamboo post on our grape trellis. The other morning we noticed these little red/orange formations all along the post. 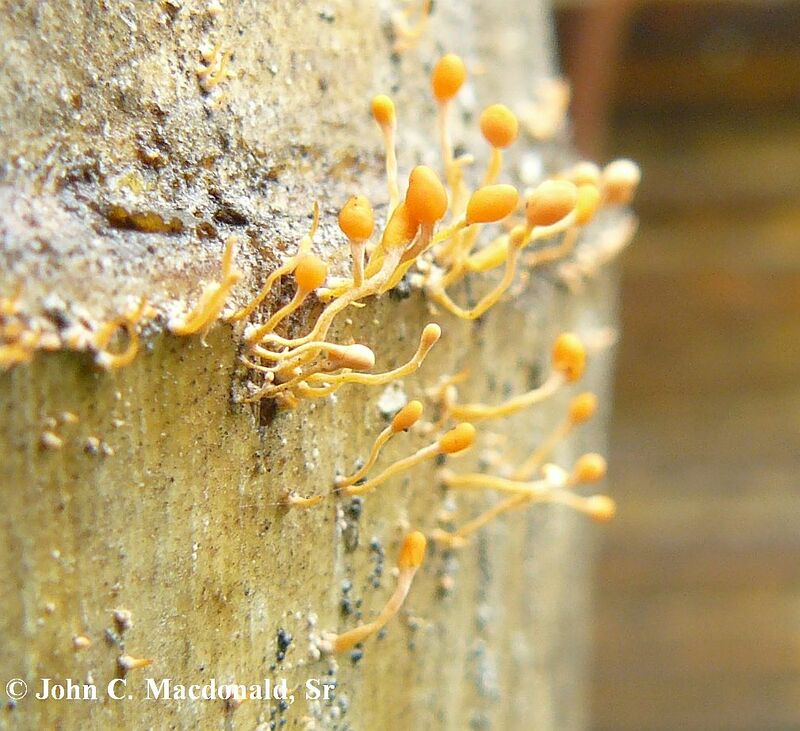 We believe they are some kind of fungus feeding off the saturated wood, but they appear almost other worldly up close! Almost looks like something we saw in Biology classes talking about human reproduction?!? Life is good (and varied) in Ecuador! 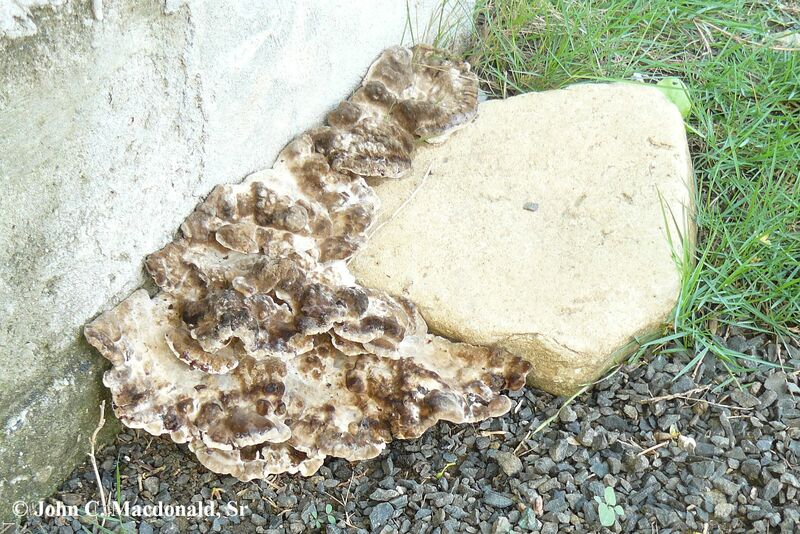 Always learn about new things from you….wonder what kind of mushrooms they are ? on March 19, 2018 at 1:58 pm | Reply prior..
Glad you liked the post. The entire region is now green on green! We love watching the seasons change as life goes on. on March 19, 2018 at 2:43 pm prior.. Always look forward to hearing from you and Mary!!!!!!!!! Those are some really interesting and large mushrooms! Thank you, Jess. We keep finding new interesting things popping up around our yard. It is fun. Love to you all! 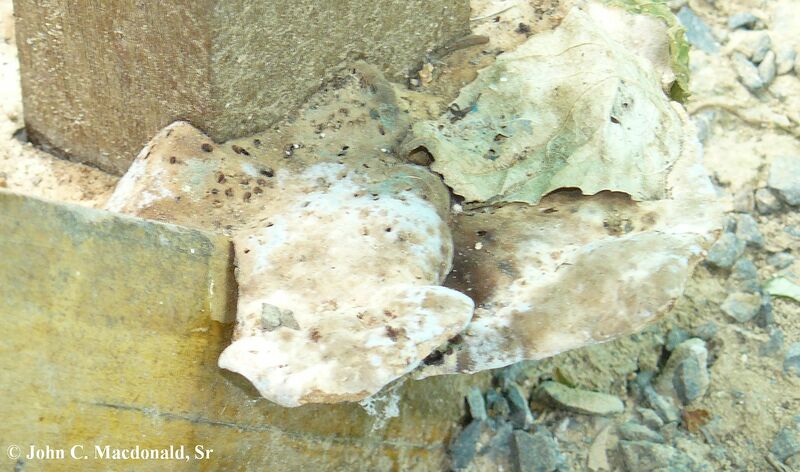 It is amazing what the extra-damp conditions will coax out of hibernation! I often wish to have a mushroom ‘specialist’ to point out how to identify which ones are worthy of culinary use, and which ones are dangerous! It would be good if the poisonous ones were brightly colored (like most poisonous insects and reptiles), but at least for us non-expert types, it is safest to avoid them all.